The United States officially entered the war that became known as World War I 100 years ago yesterday. By the time the United States passed that resolution and entered the conflict, the war had been onoing in Europe for nearly three years. No matter how you cut it, and the 1973 fire at the National Personnel Records Center notwithstanding, that many men means an awful lot of records. Exactly what a genealogist wants to see. So consider what goodies are out there. And that’s just for starters. There’s a lot more there. Check it out. A new database just launched there for this 100th anniversary is the U.S., Army Transport Service, Passenger Lists, 1910-1939. Don’t forget that the war involved a lot more than just the United States, and for a lot longer than the U.S. was involved. 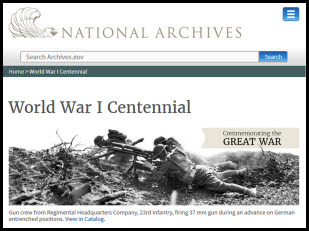 So check out the collections at FindMyPast, the Australian War Memorial, the Canadian War Museum, New Zealand at War, the National Archives of the UK, and the national archives of any other country where you might have had ancestors at the time. Columns 30 & 31 of the 1930 Federal census asked adults if they were a veterans and then which war. Also on most Texas death certificates is a question on military service. Sometimes an efficient clerk at the VA hospitals in Texas would not only say yes but list the dates of military service. These gems come with the normal errors that occur with these sources so I always verify with additional sources.